Bull-baiting was an ancient sport which involved pitting a bull against another animal. This was usually a dog such as a bull terrier, bull dog or mastiff. In England during the time of Queen Anne, bull-baiting was practiced in London at Hockley-in-the-Hole twice a week and was also reasonably common in provincial towns. At Tutbury, a bull was tied to an iron stake so that it could move within a radius of about 30 feet. The object of the sport was for the dogs to immobilize the bull. Bull-baiting continued into the 19th century. Bull-baiting dogs, including bulldogs and bull terriers, were bred to bait animals, mainly bulls and bears. During bull-baiting the dog would attempt to flatten itself to the ground, creep as close to the bull as possible, then dart out and attempt to bite the bull in the nose or head area. The bull would often be tethered by a collar and rope which was staked into the ground. As the dog darted at the bull, the bull would attempt to catch the dog with his head and horns and throw it into the air. ​At this time of year in the UK, if you are fortunate you can sometimes see male hares boxing each other in the fields. This particular figure depicts hare coursing which was until relatively recently a popular country pursuit. Usually two greyhounds were released to chase a hare to the death. The hare was not only fast but bobbed and weaved, and so great skill was required in its pursuit by the greyhound. This particular piece is a watch stand which would have been used to double as a clock on the parlour mantlepiece. It would have held the pocket watch of the man of the house after he returned home in the evening. It is a fine and rare example of a watch holder, obviously made for someone who enjoyed coursing. These figures portray Cymon and his beloved, Iphigenia. In 1700, John Dryden published their story as a poem in his Fables, Ancient and Modern. The tale has ancient roots for Cymon is the hero of The Decameron, a novella by Giovanni Boccaccio written in around 1350. The narrative tells that Cymon's aristocratic father considers him a dolt and sends him to live and work with his slaves in the countryside. In this environment, Cymon becomes increasingly coarse. One day, he comes upon highborn Iphigenia, slumbering in a field. He is so smitten by her beauty that his noble bearing surfaces, and his father reinstates him. Iphigenia is promised to another, but this tale of wars and abduction in the name of love ends happily with Cymon and Iphigenia united for life. The year 2019 marks the 200th anniversary of the birth of Queen Victoria who was potted in many forms by the Staffordshire potters. It therefore seems entirely appropriate for us to start this year with a figure of the Queen as our Figure of the Month. ​This spill vase was made in Staffordshire circa 1820 by the "Sherratt" pot bank. 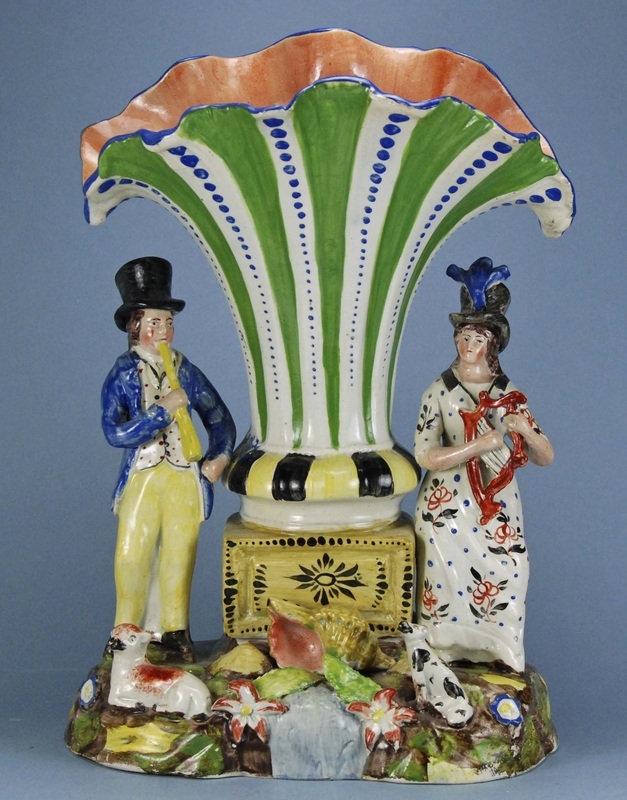 "Sherratt" figures are known for their whimsical humor, and this vase is no exception. The rampant lion and unicorn stand as they do on Britain's royal coat of arms, but "Sherratt" replaced the traditional shield between them with a clock, perhaps to remind the viewer of the inexorable passage of time. The tiny sheep at the base are yet another incongruous touch, and the identity of the classical lady on the vase's neck remains a mystery. The greyhound or whippet was a popular dog to own in Victorian times and therefore a popular subject for the Staffordshire potter. They were principally a dog of the wealthier classes who used them to pursue the sport of coursing (using dogs to chase and catch hares or rabbits by speed and sight but not by smell). The dogs usually raced in pairs. The sport of coursing has now been banned in the UK. The Victorian potters made many coursing greyhound and whippet models but these are amongst the best showing a pair standing in typical pose next to a fence. 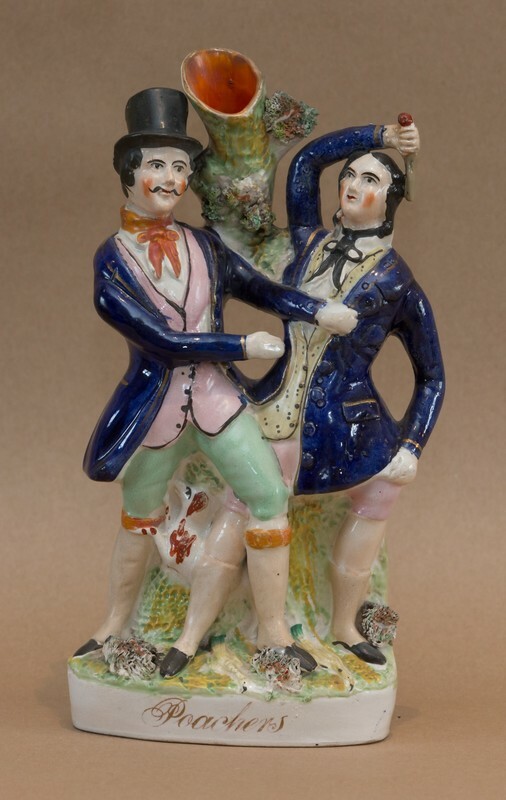 This fine pair of figures portraying Peace (right) and Justice (left) was made in Staffordshire in around 1810. Justice holds a sword signifying her power and a scale symbolic of fair measure. Peace is crowned with a laurel wreath. She holds an olive branch in one hand and with the flaming torch in her other hand she burns the weapons of war at her feet. Figures of Victoria and Albert were made in profusion and there are many models illustrated in the Harding directories. However, quality varies and this particular pair are both fine and rare. It is unusual to see a figure of Victoria without either a crown or hat of some description on her head. These figures were made in two sizes. Albert is the same in both sets but Victoria has been substantially remodeled in the larger size. The figures are either 7.75 or 9 inches tall and are illustrated in the Harding Second Addendum page 52 figs. 477, 477A and 477B. ​Street vendors and street entertainers were commonplace on the streets and at country fairs in Victorian England. This figure is of such a person who would travel from place to place entertaining those he met with his barrel organ and his monkey. This is a big figure -- perhaps 15 inches tall and circa 1870-80. 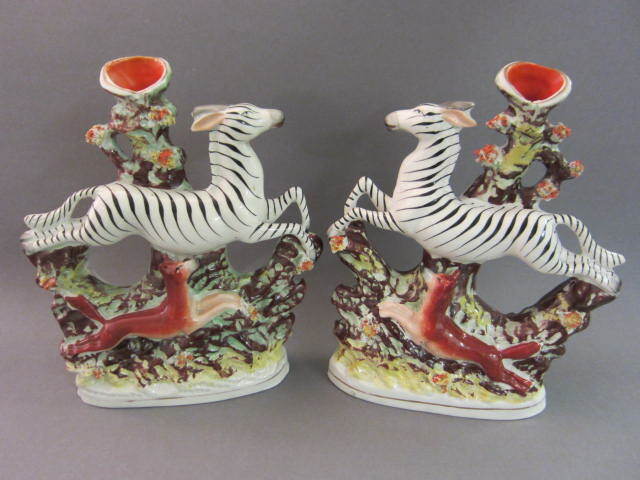 ​This pair of deer, made in Staffordshire circa 1830, is attributed to the "Sherratt" pot bank. At the time they were made, deer hunting had fallen from favor. By then, deer then, rather than being perceived as quarry, were appreciated as adornments for the estates of the affluent. Another figure which simply depicts rural life in Victorian England. There are plenty of figures that represent sea fishermen and their wives but far less common are fresh water fisherman. This figure shows a man on the banks of a fast flowing stream or river from which he has pulled a fine salmon doubtless to provide a meal for himself, his wife and a large family. There is a pair to this figure but it sits well as a single. Venus was made by the "Sherratt"
​always present on Venus-Neptune pairs from other pot banks, lends a charming touch. ​Prince George Augustus Frederick was born on August 2, 1762. He ruled Britain as Prince Regent from 1811 and on January 29, 1820, acceded to the throne as King George IV. He is remembered for his flamboyant preferences that dictated the style later dubbed "Regency", his succession of mistresses, and his troubled marriage that embarrassed the crown. On his death in July 1830, the Times editorialized with brutal frankness, "There was never an individual less regretted by his fellow-creatures than this deceased king... If George the Fourth ever had a friend--a devoted friend--in any rank of life, we protest that the name of him or her has not yet reached us." This is an interesting and unusual figure. It represents an unfortunate soldier or sailor who fought in the Crimean war and whose injuries resulted in him losing a leg or legs. 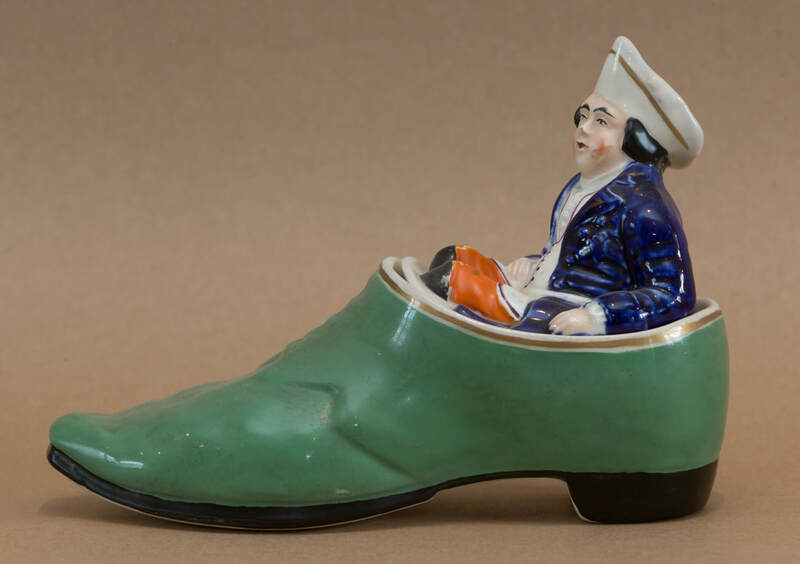 It seems somewhat bizarre perhaps one might say cruel that he should find himself sitting in a shoe which is of course the very thing he will be missing if he has no leg! ​The tops appear from time to time but the shoe is often missing and so a complete top with shoe is scarce. This shoe is painted green but it can be pink. The piece is a Crimean figure circa 1856. ​​This rare figure depicts a confrontation between a poacher and a landowner. It is truly representative of rural life in Victorian times. There were many families living in the countryside but the size of their families coupled with low incomes meant they often resorted to poaching to find food to eat. Although this was commonplace it was a dangerous thing to do as if caught, the perpetrator would find that his punishment at law would be either imprisonment, deportation to the colonies and hard labour or sometimes hanging. This figure is unusual as it is titled "Poachers". It is well modelled and coloured and dates from circa 1850. ​In 1828, William Corder went to the gallows for allegedly murdering Maria Marten and burying her body beneath the floor of his Red Barn. 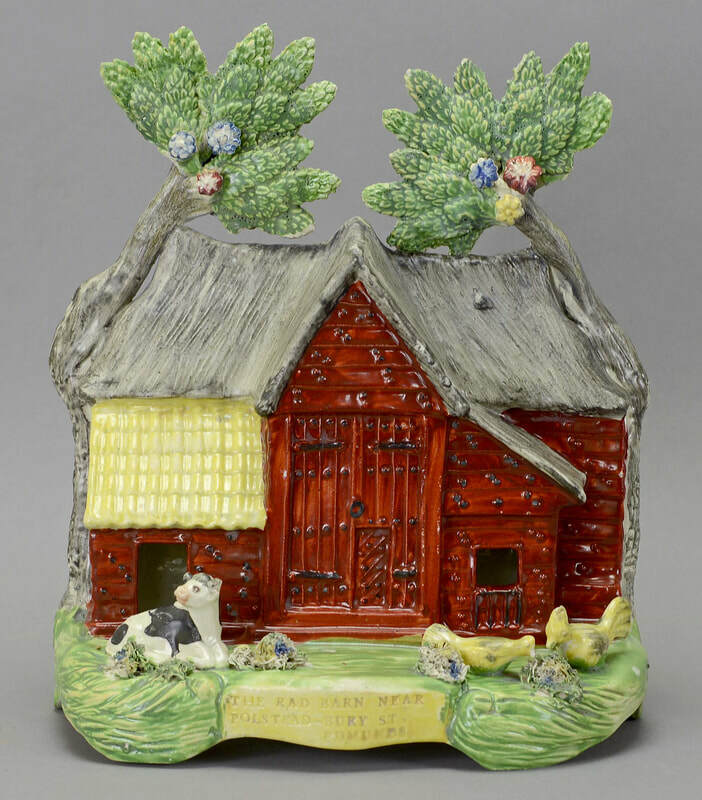 The Red Barn Murder was the crime of the nineteenth century, and earthenware portrayals are among the rarest of Staffordshire pottery objects. 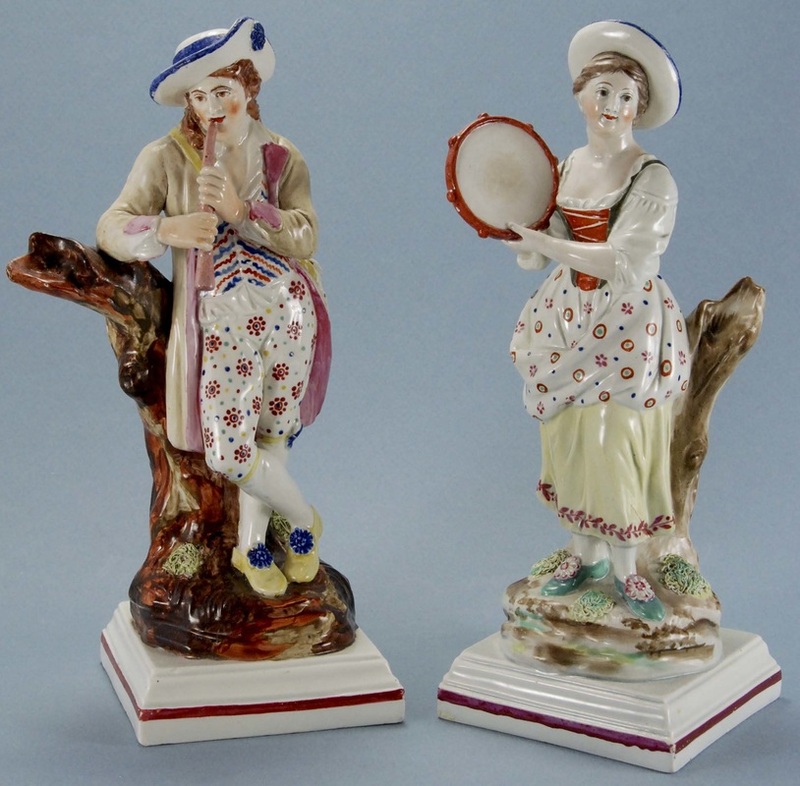 ​A pair of Victorian Staffordshire figures, probably depicting street musicians with drums astride Irish setters. Is the bowl for feeding the dog or donations from the public? 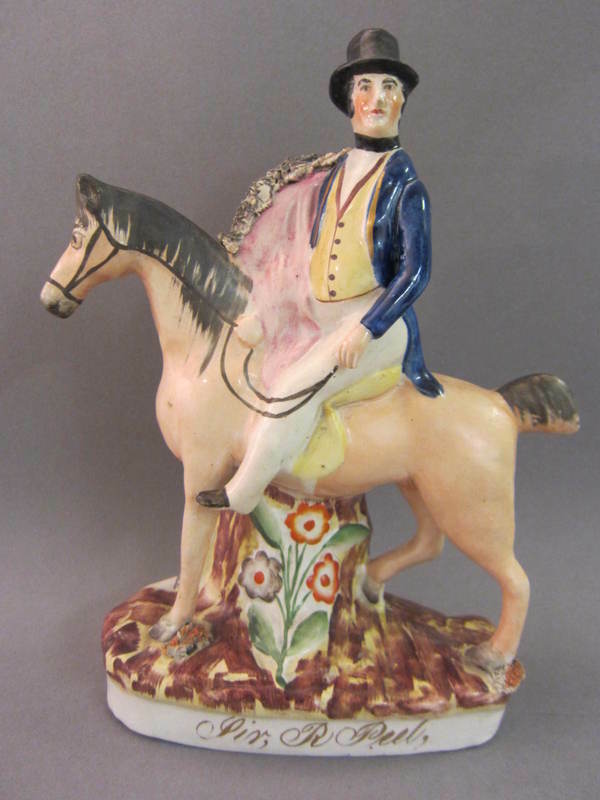 Victorian Staffordshire equestrian figure of Sir Robert Peel, British Prime Minister in the 1830s and again in the 1840s. Peel was instrumental in the creation of the modern British police force, and the police nicknames “bobbies” and “peelers” are a form of tribute to him. These fine figures of the poet Geoffrey Chaucer and the scientist Sir Isaac Newton, two men who shaped our world, were made in Staffordshire by Ralph Wood, circa 1785. A rare and large Victorian Staffordshire figure of Britannia seated above a clock face flanked by lions and holding the Union Jack aloft. This splendid gentleman setting out for a day's shooting has his dog at his side. 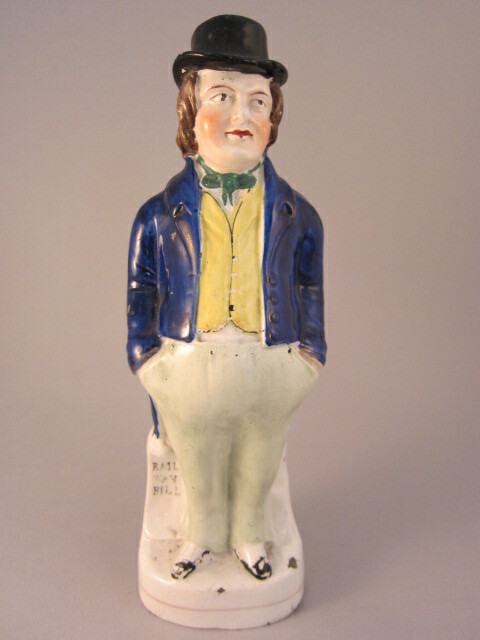 The figure was made in Staffordshire circa 1820. In that time, only gentlemen with income from land of at least GBP100 a year were allowed to hunt game animals. Others who did so risked death or transportation. What better way to start a new year than with man’s best friend: a pair of the ever-popular King Charles spaniels, seated contentedly on cushions. All collectors love dandies, and the cute couple alongside are rather special in that, unlike all other dandies, they stand with a sheep, a goat, and two dogs. Made circa 1820 and only about 5 inches tall, this tiny treasure is the perfect eyeful. 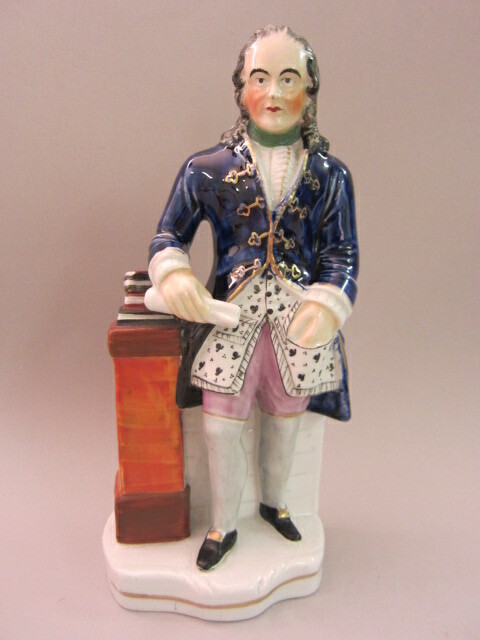 With US politics being most newsworthy at the moment, this month's figure is a fine quality figure of Benjamin Franklin, one of the founding fathers of the United States. It was made circa 1845. This stunning spill was made in the Staffordshire Potteries circa 1825 and can be attributed to the "Leather Leaf Group" pot bank. It is taller than most because the vase has been placed atop a plinth. Perhaps for this reason, the lady and gentleman musicians wear rather tall hats! Relatively few fine cat figures were produced in the Staffordshire Potteries during the nineteenth century. This was because cats were not yet widely accepted as domestic animals and were still associated with witchcraft. 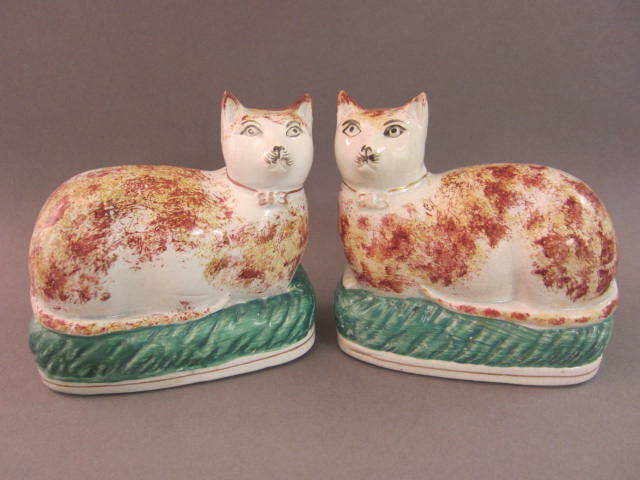 This fine pair of recumbent cats date to circa 1850. ​This figure depicts the American actor Thomas Dartmouth Rice in the role of Jim Crow. Rice created the Jim Crow routine in the US circa 1828 and performed it on the London stage in 1836. His performance was a sell-out, and Jump Jim Crow quickly became an international song and dance sensation. This figure was made circa 1836. Jim Crow figures were also made in the Victorian era. 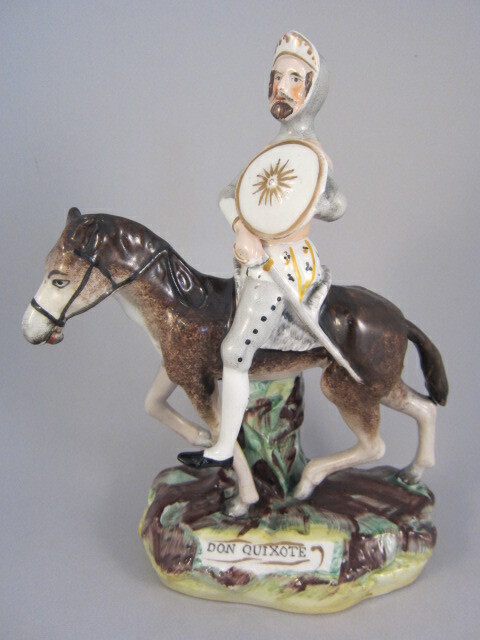 Many Victorian Staffordshire figures depict characters from literature, as does this fine figure of Don Quixote, from Miguel de Cervantes's novel The Ingenious Gentleman Don Quixote of La Mancha. This example is decorated in the manner of the Thomas Parr Factory. 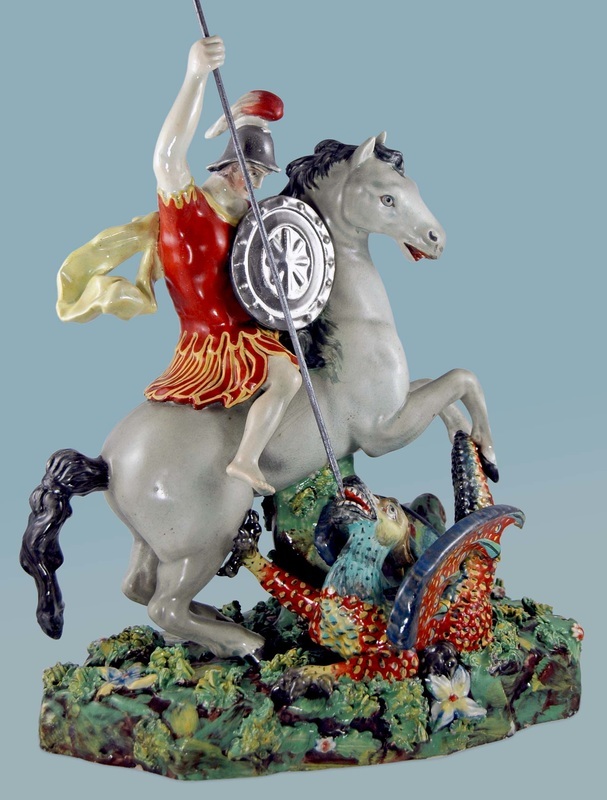 The pot bank of Enoch Wood and James Caldwell made this splendidly painted figure of St. George and the dragon some time between 1805 (when silver luster was introduced commercially) and 1818 (when the Wood & Caldwell partnership dissolved). Wood & Caldwell made this figure in two sizes, this being the larger. Jacobus de Voragine’s popular medieval book of hagiographies tells the story of Saint George and the dragon. A beautiful princess was to be sacrificed to an evil dragon, but Saint George, after making the sign of the cross, slayed the dragon with his lance—and it is in this pose that Saint George is traditionally shown. 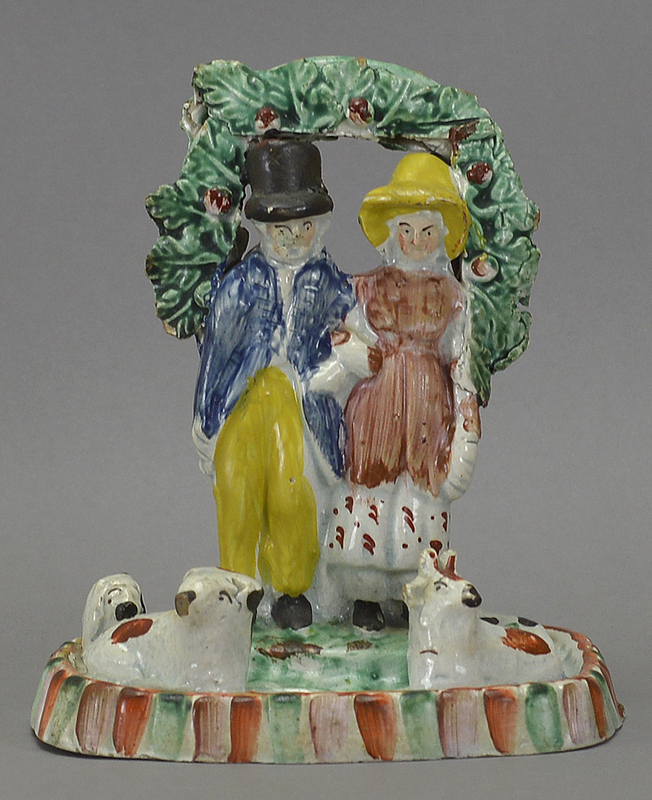 This petite pearlware figure of a chimney sweep alongside a woman, circa 1815, recalls the "climbing boys" (sometimes younger than six) who were forced to scale chimneys. This perilous occupation took its toll on the health and sometimes claimed the lives of these children who were dubbed "English Slaves." ​“Babes in the Wood” is usually a relatively common and uninspiring Victorian figure, but this particularly early circa 1840 version is quite superior in both quality and decoration. ​This piper and his companion tambourine player are among the earliest of enamel-painted figures. They were made by James Neale circa 1780, and she is impressed with the NEALE & CO. mark beneath. A classic pair of “man’s best friend” to start the new year. 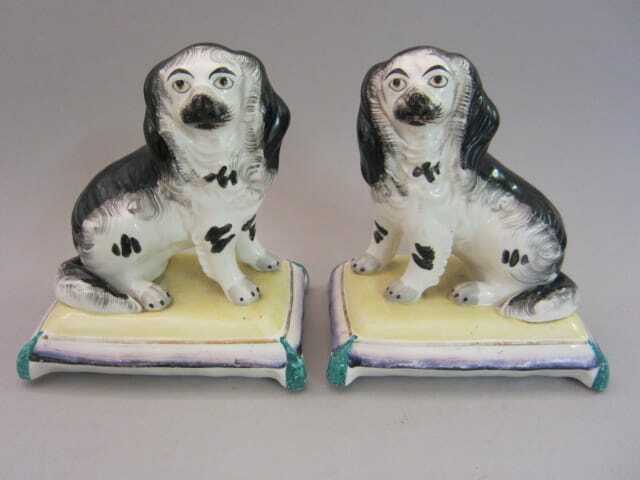 This pair of spaniels standing on pink bases decorated with leaves is known as “Majesty & Grace” and was made circa 1850. ​Titled on the plaque on the base DR SYNTAX STOPPED BY HIGHWAYMEN, this months figure is after a Thomas Rowlandson engraving by the same title. Rowlandson's illustrations on the Dr. Syntax theme inspired William Combe's amusing Dr. Syntax poems, published from 1809. This figure is attributed to Patriotic Group. H: 8.6”. It is very rare, all other recorded examples having lost the highwayman from the base. This month's photo is prompted by the furry devils that are coming into our garden at this time of the year, burying nuts from our neighbors' trees in everything from garden borders to small pots. Squirrels are quite rare in Staffordshire pottery, and this 9.5” tall version decorated in the manner of the Thomas Parr factory is a rarity in Victorian Staffordshire. A rare armorial container with removable stopper. The purpose of the container is unknown. It seems ill-suited for use as either a vessel for liquid or a spill vase, so perhaps it was intended to be purely decorative. Made circa 1820. The Staffordshire potters of the early nineteenth century reflected the public interest in wild animals popularized by the traveling menageries. This fascination continued into the Victorian era. Leopards like this fine pair are rare and desirable. Made circa 1850. Most performing bear groups have a little lion (in reality, a dog dressed in a costume and wig) in the foreground, but now and again there is a monkey instead, as seen in the group alongside. Notice the stiff leathery-looking bocage leaves, the long leaves on the base, and the distinctive flowers. These all confirm attribution to the unidentified pot bank dubbed the Leather Leaf pot bank. The figure was described in P.D. Gordon Pugh’s Staffordshire portrait figures book as “MONKEY PLUCK." The monkey has a pannier in its back, and a barrel at its side. Legend has it that monkeys were trained by monks to pick the choice inaccessible “cloud mist” green tea leaves. Hence the name monkey pluck. This stunning bear baiting group was formerly in the Hope McCormick Collection. The bear's appealing expression and the man's comic pose offset the savagery of the scene. The once-common sport of bear baiting was banned in England in 1835, so this rare group, made circa 1820, is a last reminder of a sport that was once too common. 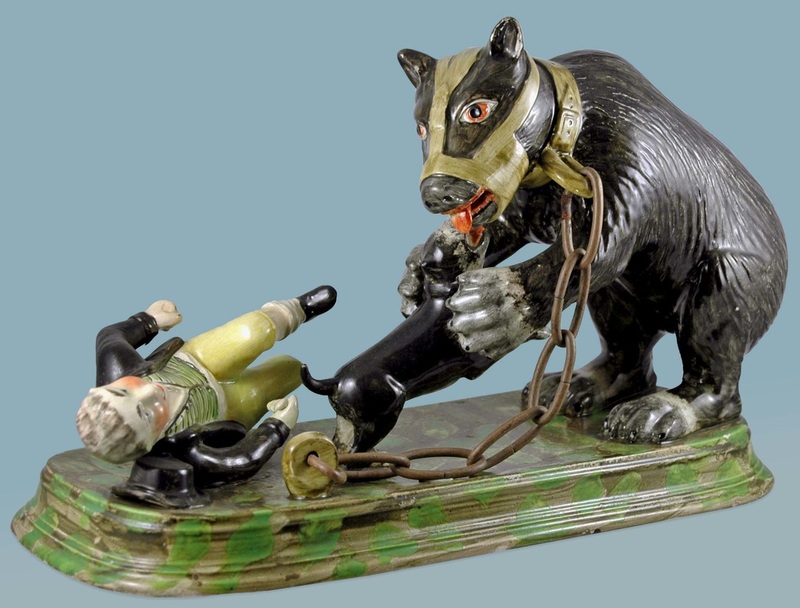 A rare Victorian Staffordshire titled figure "DON'T YOU WISH YOU MAY GET IT"
depicting a dog trying to get to a monkey, the dog tethered to a kennel. Made circa 1860. Figures impressed "TITTENSOR" are so rare that this figure couldn't resist sporting its rear view, complete with three marks. 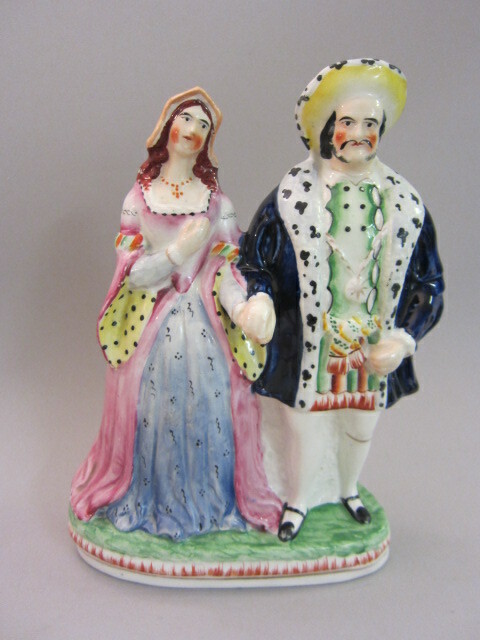 Unlike most bocage figures, which are enamel-painted, this group is decorated in under-glaze colors. And whereas most little bocage shepherds and shepherdesses stand on individual bases, here the bases are combined to form one unusual arrangement. Tittensor groups are particularly naive, and that just adds to their charm. This very rare figure portrays George Hudson (1800 - 1871), who inherited a fortune and used it to invest in the early railroad. Hudson came to control one-third of England's railways and he was known as "The Railway King," but in 1848, his financial mis-dealings were exposed. He lost his money and died in obscurity. "RAIL WAY BILL" is painted alongside the figure because Hudson opposed the Railway Bill that introduced government oversight of private railways. The figure is approximately 7.5" inches tall and was made circa 1835. The design source is an engraving for the Dramatic Magazine after A. M. Huffman by J. Rogers. This rare and (so far) unrecorded Victorian Staffordshire figure, circa 1850, depicts spaniels on either side of a watch holder and is surmounted by a candle holder. The figure stands 8.75" tall and is 8" wide. It is reminiscent of the early pearlware "Royal arms" groups. If you have seen another figure like this, please contact us.